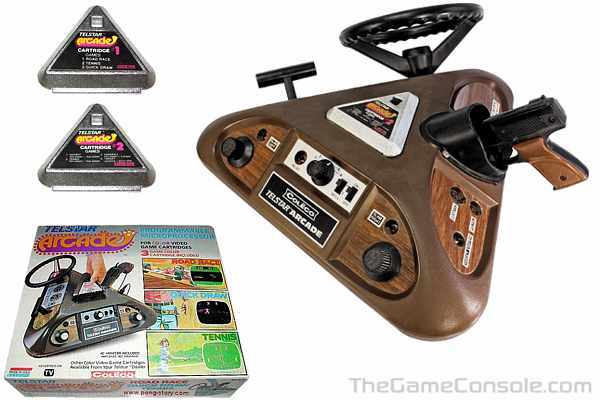 The Telstar Arcade is maybe one of the most interesting systems made by Coleco, and also the most advanced PONG system released in America, although it played non-PONG games. Made in a triangular case, the system could play three types of games, each being played on one of the three sides of the case. Obviously, the first side allowed playing PONG games (TENNIS and the like), and the second side allowed playing target shooting games. Nothing very different from most other systems, except the gun storage. The third face was the most interesting: it allowed playing car racing games. Very few systems offering that type of games were released at this time, and the games were only played using rotary controllers or some sort of joysticks. Coleco used a very uncommon cartridge format: a silver triangular case which connects horizontally on the top of the console. Nothing in common with the other black cartridges with plug vertically. Coleco released only four cartridges. The first one was sold with the system and the others were available separately for the price of $25. Two flyers came with the system to order cartridges #2 and #3.